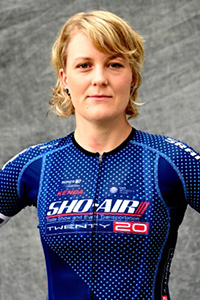 Steph Roorda started riding bikes as cross training in the summer for downhill ski racing. She always knew she loved riding bikes. So when she was finished downhill ski racing it was an easy and obvious transition to bike racing. She first started with Track, Cyclocross, and Road racing. As a few years went by training and racing became a bigger part of her life, with a focus on Track. Steph then had to opportunities to make it her full time career representing Canada. Today she is 15 X World Cup and World Championship medalist. She is a founding member of the successful Canadian Women’s Team Pursuit squad, and a fundamental character and teammate in its success. Through training for Team Pursuit she has also gained notable success on the road. Steph is looking at transferring her knowledge of tactics and teamwork to a full time road racing career. I grew up as a downhill ski racer. I have always been an athlete. Seeing how I can push myself, where my limits are, motivates me. When I starting riding bikes more, it was obvious to me that I was going to race them. My best friend, Noe. Her values in her life and how she stands up to the world with strength is inspiring. She also basically taught me how to be a good bike racer. Finding things out about yourself, things that you would never had thought you could achieve. Being a fundamental team member of the Canadian Women’s Team Pursuit team. New Zealand. It is an extraordinarily beautiful country. Be patient with yourself, your career will be unique to you. A girl, in a city, with a job, riding my bike around! I would spend 10 days with my family, and we would be skiing somewhere with lots of snow. http://teamtwenty16.com/education.htmWhy is continued education important? Continued education is especially important for female bike racers. There are very few athletes who will be able to have a full cycling career that sustains them for their entire life. It is important to have some balance, and a vision of what there is outside of an athletic career. An education is a great way to see that.